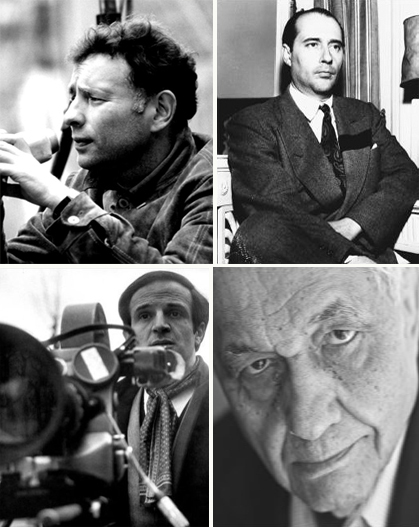 Astruc, Bazin, Truffaut, and Sarris. The overarching theme of Francois Truffaut’s article was that film should be analyzed as its own artform, with its own set of techniques, themes, and discoveries. Filmmaking before the French New Wave (again, I refer back to post-war cinema and the anti-Hollywood, independent film movement) was defined by adaptations of classic literature and other stories that were already familiar to the popular culture machine. Indeed, we still see films made of these same beloved stories today. I’m thinking specifically of Grimm’s fairytales, classic stories originating from books like Robin Hood and Tarzan, and costume dramas based on historical legend such as Arabian Nights or King Arthur. Truffaut was writing from the perspective of the avante-garde, the surreal, and the simply unique: every movement that was just beginning to blossom in film that stemmed from the art world and not from literature. Truffaut wanted film to push the audience’s boundaries rather than cater to their norms. As I continue to highlight the work of great auteurs, it will become clearer how specific techniques and personal styles of filmmakers enhance their films. For instance, think of David Lynch and his feature films like Eraserhead or his 1990 television series Twin Peaks. If we refer back to some of his short films, from the late 1960s into the 1970s, it is obvious how his personal style informs every project he has had a hand in. But more on the Lynchness of David Lynch later. Therefore, I want to explore the work of a few distinct, celebrated auteurs and discuss how their work is indicative of how they think and feel.